Social media was buzzing earlier this week with news that the USA was advancing to the next round in the FIFA World Cup. It seemed every other status update on my Facebook news feed was my friends sharing the excitement for the win and their anticipation for the US vs Portugal game on Sunday in Brazil. John won’t miss the game so we’ll be watching from our home too. According to Wikipedia, the World Cup has more viewers than the Olympic Games themselves making it the most widely viewed sporting event in the world! If you haven’t seen “The World is Ours” Remix music video featuring Aloe Blacc, David Correy and Wisin yet, you need to check it out! It’s Coca-Cola’s song for the 2014 FIFA World Cup. Not only does it have a great beat, but it’s message is also very inspirational. The song was written by Rock Mafia and produced by Brazilian-born Mario Caldato Jr. They succeeded in capturing the flavour of Brazil by adding samba, baile funk and technobrega to the mix and sharing this Brazilian style with the world. It’s a song that makes me want to get up and dance. I love the positive, uplifting message it brings. This line in particular is just awesome: “Run like you’re born to fly. Live like you’ll never die”. 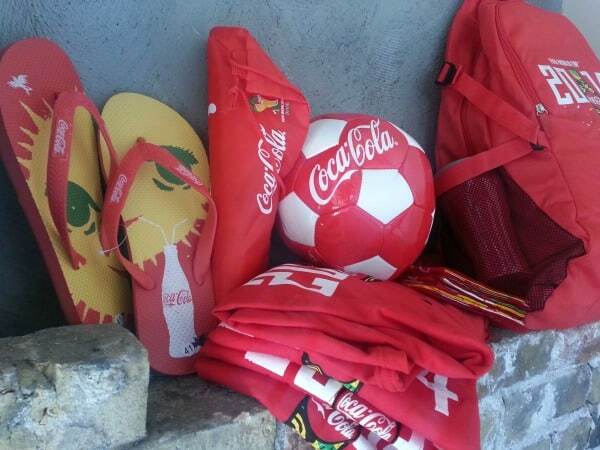 You might have already seen the special limited-edition FIFA World Cup branded Coca-Cola packaging in stores already. Look for the new design on bottles of Coca-Cola, fridge packs and cans. I have a family member who collects Coca-Cola memorabilia so she’ll be wanting to get her hands on one of these special designs! The Happiness Flag is a feat in itself! In fact, it’s pretty spectacular. It is the largest-ever, digitally produced Photomosaic flag and it was unveiled by Coca-Cola ahead of the opening match of the World Cup. It features 200,000 images submitted by fans from 207 countries. Brazilian street artist Speto collaborated iwth Argentinian artist, Tec, to create its unique design. You can click on any part of the flag and get a better look! I sure have! It has been very exciting! Been watching lots of matches – can’t wait to watch USA again tomorrow! Yes I have, been yelling at the tv a lot. yes, i’ve been keeping up! We’ve been watching whenever we can, and following online too! I’ve watched a few games, mostly just the U.S. games, though. GO U.S.!! !